Russian drivers are always fun to watch! This is another video from mother Russia. The stop light turned red and a bike crossed the stop line, driving by two other vehicles. Then, a SUV driver wanted to teach a lesson to the driver. He also crossed the stop line, blocking the rider! This was the start of an epic fight. The biker took off his helmet in a fist fight like a hockey player. The driver thinks he is tough, but one hit was enough for him; he fainted! Then, a bunch of angry men attacked the biker! The most hilarious moment was the guy who fainted and tried to get back on his feet. He was leaning forward and almost fell forward! We have learned one thing online; you should never drive in Russia! 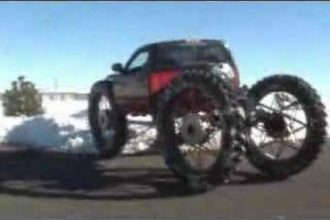 Get A Look At This Amazing Yeti Concept Truck!